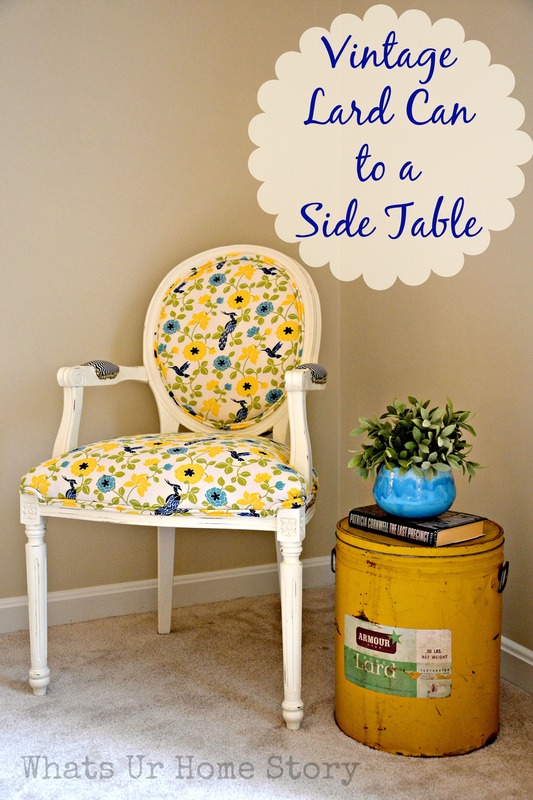 As I was sitting down to write this post after a long evening trying to figure out why Google Adsense sent me a violation warning email (blogger troubles) it occurred to me that I haven’t really given this Lard can side table project its due. It got lost in all the frenzy of my totally DIY’d guest bedroom reveal last year. So here’s what you do if you ever come across a Vintage Lard Can. Swoop down and grab it before anyone else has a chance to set eyes on it. I found my beauty at The Old Lucketts Store Spring Market of 2012 for $15. Check the can thoroughly for rust. Given the fat content in Lard you’d be lucky if you found one without much rust. Mine was pretty rusty. With the help of some sand paper and Krylon permanent protective sealer I was able to get my yellow dude (since we are talking lard I somehow have to go with a ‘he’; if it is your first time here I have a thing about assigning gender to things around my home) back in tip top shape. More on that here. Three coats of sealer and he was all ready to use. 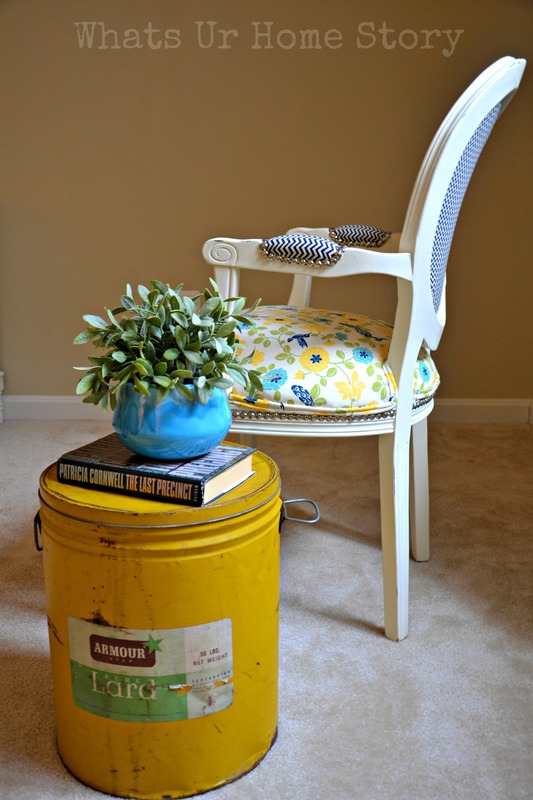 Voila my Vintage Lard Can Side Table! I’m happy to report that after more than a year of use he is till going strong, no stains on the carpet or any rust or chipping paint. Don’t cha love my yella fella? 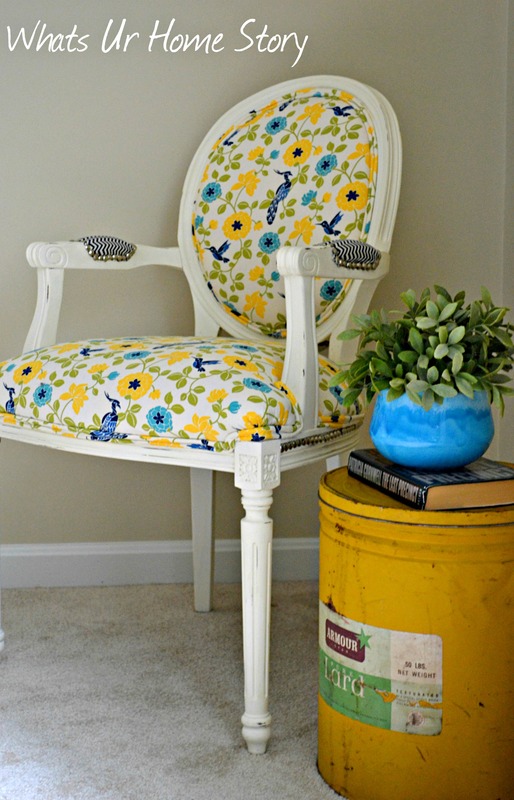 Oh and by the way, that chair was a $20 Craigslist find that I re-upholstered and made over with chalk paint. You can read about that adventure here. I would have never thought of a lard can other than a lard can before this! Genius! LOL! All credit goes to the yellow that got the thought process rolling. I just HAD to stop in to see what a vintage lard “tub” was ! Haha, looks great – just never seen one before! I love this SO much. It looks super cute. Great idea for repurposing. Fabulous! I love the cheery color! I never would have thought to make that into a side table. Thanks for linking up with us at Best of the Nest! Thanks Jennifer. Glad to be party of the party. Found so many inspiring projects already. What a great idea! thinking outside the box, love it.